The Balkans Chronicle: Was 'Srebrenica genocide' a hoax? Was 'Srebrenica genocide' a hoax? From the very beginning of the war, the Serbs were presented as the new Nazis. Croats and Muslims were presented not as combatants, but as innocent victims.One of the most stubborn factoids of our time is the myth that the massacre at Srebrenica in 1995 during the Bosnian civil war was solely about the killing of innocent Muslims by vicious racist genocidal Serbs. It is a relic of the coordinated media message put out at the time, which demonized the Serbs as cruel oppressors and ignored any atrocities of equal or greater magnitude by other parties to the conflict.The Joseph Goebbels Nazi style “Big Lie”was spread world-wide with the mainstream media-connected resources of a multi-million dollar funded American “public relations” camp; lobbying firm called ‘Ruder Finn’ – whom also worked as a lobbying group in Washington on behalf of the Islamist Nazi terrorist KLA and Tudjman’s HDZ Fascist neo-Ustasha Nazi racist government responsible for the ethnic cleansing of over 350,000 Krajina province Serbs from 1990 to 1995 and for the murder of at least 15,000 Serbs during the same period.James Harff, of PR firm Ruder Finn:http://www.sourcewatch.org/index.php?title=James_Harff Philippe Morillon:The fall of Srebrenica in 1995 was the "direct reaction" to the massacres of Bosnian Serbs by Naser Oric's forces in 1992-1993. Morillon acknowledged that Oric's troops had committed war crimes in eastern Bosnia. Morillon personally witnessed the exhumation of the bodies of Bosnian Serb civilians and soldiers who had been tortured, mutilated, and executed. He saw with his own eyes the Serbian villages that had been burned to the ground in the Srebrenica pocket. More than anyone else, Morillon understood the level of devastation in eastern Bosnia and the extent and nature of the massacres of Bosnian Serbs.“I feared that the Serbs, the local Serbs, the Serbs of Bratunac, these militiamen, they wanted to take their revenge for everything that they attributed to Naser Oric. 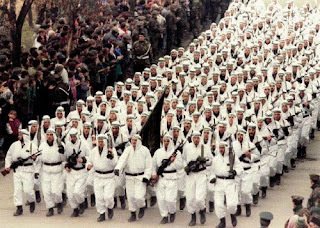 It wasn’t just Naser Oric that they wanted to revenge, take their revenge on; they wanted to revenge their dead on Orthodox Christmas.”Phillip Corwin, former UN Civilian Affairs Coordinator in Bosnia during the 1990s, said: “What happened in Srebrenica was not a single large massacre of Muslims by Serbs, but rather a series of very bloody attacks and counterattacks over a three year period which reached a crescendo in July of 1995.”The list of 7,000-8,000 Bosnian Muslims contains the names of the individuals who have been reported missing — it is not the list of the victims of a crime, those who have allegedly lost their lives during Srebrenica takeover. If there really was a massacre -- and it seems realistic to speak about 700 victims -- then this is a war crime and the perpetrators must be held accountable. But the difference between the 700 and the commonly referred to 8,000 is not numerical -- it is political.The number of 7,000-8,000 missing Bosnian Muslims, presented to the public as the victims of a war crime, is one of the biggest lies and manipulations continually present in this part of the world!There is a world of difference, victims of the war crime are men who have been captured and executed without trial, while the victims of war are individuals who were killed during the battles, like Bosnian Muslim troops from Srebrenica column, which suffered heavy casualties after being engaged in battle with the Bosnian Serb Army.Number of the Bosnian Muslim victims inflated to justify Srebrenica genocide.Dr. Ljubisa Simic, pathologist and forensic expert who had full access to the Hague Prosecution’s forensic evidence in relation to the alleged “Srebrenica massacre”, found the scientific evidence of the Srebrenica hoax: the total number of victims, the number of the executed victims, the time of death and the causes of death tell a story that is entirely different from the official myth:Forensic analysis of post-mortem reports : http://www.amsterdampost.nl/442-executed-victims.html Internationally respected military forensic specialist Dr Zoran Stankovic, who reviewed the findings of the six experts employed by the Tribunal wrote that the effort lacked standard procedures, several of experts also lacked familiarity with wounds inflicted by military ordinance and some parts of the reports are “contrary to the generally acceptable forensic standards”. According to Dr Stankovic, many of the bodies exhumed from 17 gravesites were found in an advance state of decay “skeletonized, disarticulated and decomposed” lacking soft tissue and body parts that could help determine the cause of death. “Ascertainment of the cause of death in the cases of decomposed bodies is generally extremely difficult and in most case impossible…It is not allowed that [ICTY] experts provide their opinion in that regard and put forward the assumption having no grounds in autopsy findings.”Between 200 and 300 blindfolds and ligatures were exhumed with bodies by the ICTY, and as Dr. Stankovic notes, these are sure signs of execution......Forensic specialists of the Hague Tribunal are perhaps the only professionals in their field in the entire world who do not depend on material evidence in order to determine the manner (and sometimes even the cause) of death…http://www.balkanstudies.org/articles/dna-testing-and-srebrenica-lobby Between 1996 and 2001 a team of investigators led by Australian forensic scientist Dean Manning was employed by the ICTY to exhume graves thought to be associated with the Srebrenica massacre. The team discovered 448 blindfolds and 423 ligatures among the bodies exhumed from the gravesites. They determined that 1,785 individuals died of gunshot wounds, 169 died of probable or possible gunshot wounds, 67 died of Shrapnel wounds or blast injuries, 11 died of gunshot and blast injuries, 6 died of other causes (trauma, suffocation, etc. ), and 1441 died of undetermined causes. Investigators also found shell casings among the bodies which indicates that some individuals must have been shot in or near the gravesite.The shell casings were found in the same graves where the blindfolds and ligatures were found. Those buried at the Srebrenica Memorial Complex not only were not killed in July 1995, but actually died much earlier,, even in the early 1980s – more than 10 years before the civil war in Yugoslavia even started: Fetahija (Nazif) Hasanovic, b. 1955 – d. Dec.15, 1996, Srebrenica; Sukrija (Amil) Smajlovic, b.1946 – d. May 2,1996, Zaluzje; Maho (Suljo) Rizvanovic, b.1953 – d. Jan. 3,1993, Glogova; Mefail (meho) Demirovic, b.1970 – d. May 10, 1992, Krasanovici; Redzic (Ahmet) Asim, b.1949 – d. April 22, 1992, of Osman (Ibro) Halilovic (1912-1989), Nurija (Smajo) Memisevic (1966-1993), Salih (Saban) Alic (1969-1992), Mujo (Hasim) Hadzic (1954-1993), Ferid (Ramo) Mustafic (1975-1993) and Hajrudin (Ismet) Cvrk (1974-1992)...............Hamed (Hamid) Halilovic (1940-1982), transferred from the nearby cemetery in Kazani, who apparently died a full 13 years before the Srebrenica "genocide. "Several hundred soldiers as well as civilians were transferred to the Srebrenica Memorial from other cemeteries and reburied, with Muslim burial rituals.http://www.srebrenica-project.com/hol/index.php? “We have discovered 500 persons declared dead as victims of Srebrenica massacre to be alive.” said Mirsad Tokaca, the director of Sarajevo-based Research and Documentation Centre at the presentation of the Bosnian Atlas of War Crimes in Banjaluka.In addition, he stated that according to RDC findings 70 persons buried in the Memorial Centre Potocari, along with other victims, haven't been in Srebrenica at that period. The Red Cross reported at the time that some 3,000 Bosnian Army soldiers managed to reach Muslim lines near Tuzla and were redeployed by the Bosnian Army “without their families being informed.” The number of military survivors was also confirmed by Muslim General Enver Hadzihasanovic in his testimony at The Hague. In the summer of 2005, on the 10-year anniversary of the event, the "Srebrenica Research Group," composed of mostly American and British media and academic figures, as well as former U.N. civil officials and military observers with ex-Yugoslavia experience, put up a website in which the entire "Srebrenica massacre" account was reconsidered and demystified. 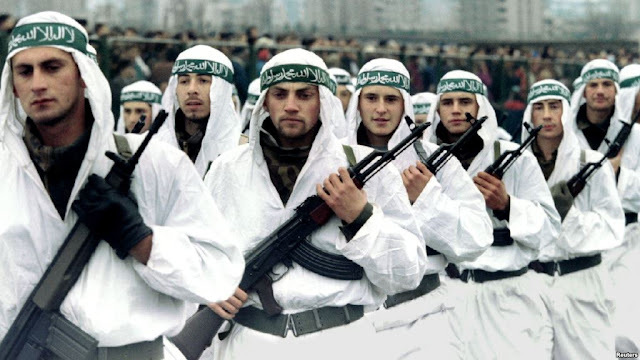 Instead of the 7-8,000 figure, U.N. officials and U.S. Congress experts were quoted giving figures of "700-800," "the low hundreds," "about 2,000 Muslims and Serbs total," etc.http://www.srebrenica-report.com/POLITICAL BACKGROUND—The Bosnian conflict between Serbs, Croats and Muslims resulted from the break-up of the former Yugoslavia which was in turn caused by American and European recognition of breakaway states.Two prominent supporters (at the time) of the late Muslim leader Alija Izetbegovic, his Srebrenica SDA party chairman Ibran Mustafic and police commander Hakija Meholjic, have subsequently accused Izetbegovic of deliberately sacrificing the enclave in order to trigger NATO intervention. 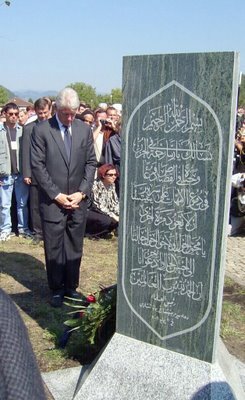 Meholjic is explicit: in his presence,Izetbegovic quoted Bill Clinton/http://www.ex-yupress.com/dani/dani2.html/ as saying that 5,000 dead Muslims would be sufficient to provide the political basis for an American-led intervention on the side of the Muslims.In a letter to Izetbegovic, Naser Oric, who refused to show up in Sarajevo as a member of the Srebrenica delegation, said the following: “I opposed your decision to surrender Srebrenica which you had arranged with the French and I particularly disagreed with the ensuing events and too many sacrificed civilians, regardless of the effect made. I honoured the agreement and I can tell you that the dearest amount of cash I have ever received is the two million Deutche Marks I collected as a reward on the Yellow Bridge near Bratunac on my way out.”From Kosovo in 1999 to the Congo in 2005, Srebrenica is held up as conclusive proof that the West is morally obliged to intervene militarily in conflict situations. Jack Straw argued in defence of Western intervention in Macedonia in 2001, on the basis that Srebrenica showed what happened when the West was reluctant to intervene. Liberal commentator David Aaronovitch used the same argument to explain his support for military action in Iraq. When discussing the killing of 60 Congolese soldiers by UN troops, UN General Patrick Cammaert argued in favour of robust military intervention, because of ‘the lessons of Srebrenica, Somalia and Rwanda.By falsely identifying Milosevic with the Bosnian Serb leadership and by exploiting the notion that Srebrenica killings were part of a vast Serb plan of "genocide" carried out against non-Serbs for purely racist reasons, Madeleine Albright was able to advocate the NATO war against Yugoslavia as necessary to prevent "another Srebrenica" in Kosovo, where the situation was altogether different. To use "Srebrenica" as an effective instrument in the restructuring of former Yugoslavia, notably by replacing recalcitrant Serb leaders by more pliable politicians, the crime needed to be as big as possible: not a mere war crime (such as the United States itself commits on a serial basis, from Vietnam to Panama to Iraq), but "genocide": "the worst atrocity in Europe since the Holocaust".We all remember the Western media hoaxes and fakery concerning the events in Jenin and Qana recently and how these media frauds were used to demonize Israel and the Jewish people.And let it be noted: the Serb is always the murderer, just like in World War I, just like in Hitler’s invasion of Yugoslavia, and now for the third and presumably last time. The US Empire and its vassals have achieved the perversion of facts that allows the Serbs, instead of being, as they were, the victims of a genocide perpetrated by the Catholic Church and the Nazis, to be portrayed as a fascist people of perpetrators. "Srebrenica: A Town Betrayed" follows interviews and revelations by Bosnian-Muslim investigative journalist Mirsad Fazlic, who doesn’t appreciate the fictitious, black-and-white version of the Bosnian war that is perpetuated by the international community and by Bosnian officialdom, which still honors wartime president Alija Izetbegovic as a national hero when Fazlic and others know he was the opposite. The film really begins only at the four-minute mark, and its main shortcoming is the ubiquitous, stubborn marriage to the notion that the number “7-8,000 killed” is anything other than a concoction that the world has been working backwards for 16 years to make seem real. Labels: Was 'Srebrenica genocide' a hoax?